Our partners and supporters at the Knight Foundation have announced a new round of the Knight Cities Challenge, which gives grants to people and organizations around the country for projects that make their cities more livable. The deadline to apply is October 27—check it out! 1. Affordability beyond the median. When we talk about how affordable a given city or neighborhood is, we usually reference median housing prices: the home for which equal numbers of homes are more and less expensive. But in most places, affordability is mainly a problem for lower-income people, who are likely to be purchasing relatively low-cost housing. In these cases, what matters more than the median price is the price of that low-cost housing. We illustrate the difference with two Chicago-area neighborhoods that have identical median housing prices, but very different 25th percentile prices (that is, homes that are cheaper than 75 percent of other homes in the area). The neighborhood with cheaper 25th percentile housing has much more economic diversity. Not coincidentally, the more diverse and affordable neighborhood also has a much more diverse range of housing types, from single family homes to small apartment buildings and a handful of highrises. 2. Eleven things you’d know if you read City Observatory. We may be preaching to the choir here, but as part of celebrating our first birthday, we’re collecting some of the highlights of our work over the last year. We put eleven of the most important research, analysis, and insights—from the way we subsidize car travel, to the “secession of the rich,” to the ways we’ve made traditional, diverse, and sustainable neighborhoods illegal—into a one-page PDF that we hope you’ll find helpful. If you do, feel free to share with others! 3. Why creating meaningful transportation change is so hard. We respond to an excellent post from Yonah Freemark at The Transport Politic, which argues we can’t rely on changing preferences alone to create an urban transportation revolution in the U.S. While we disagree somewhat on trends in driving—we tend to believe that the recent uptick in driving per capita is related to the sharp decline in gas prices, while Freemark argues it’s likely to continue regardless of gas prices—we agree that available transit services and land use patterns make it extremely difficult for people who might like to take transit, or bike, or walk, to do so. While the evidence strongly suggests a major change in Americans’ preferences towards more compact, walkable urban neighborhoods, our “shortage of cities” means that only a relatively small number of them can actually move to such areas. 4. Beyond gas: The price (of driving) is wrong. While we argue that gas prices have an important effect on driving behavior, they’re just part of the overall price of using private vehicles. When that price is too low, it hides the real cost of car usage—from the construction and maintenance of road infrastructure to the cost of more sprawled-out land use patterns and the public health costs of deaths and injuries caused by car crashes—and causes people to drive more than they would if they absorbed more of the real cost of driving. We revisit our review of a study from the Frontier Group that reveals just how much drivers reap in subsidies, busting open the myth that the gas tax covers the cost of public infrastructure for private vehicles. 5. Another City Observatory post was republished at The Atlantic this week: this time, our comparison of the way we give public assistance for food and housing, and what that reveals about the flaws in our affordable housing system. 1. For nearly two decades, the percentage of total national income going to workers has been falling. What’s making up the difference? As Matthew Yglesias shows at Vox, the answer is income accruing to the owners of housing. This trend shows that rapidly rising home prices, especially in urban centers where supply-restricting zoning regulations create a “shortage of cities,” are not just a concern because of neighborhood-level segregation: they’re also responsible for patterns of inequity at a national, macroeconomic level. This pattern has actually been established internationally as a possible explanation for Thomas Piketty’s widely-read theory about the underlying causes of growing inequality globally. 2. Via Streetsblog, a major set of reforms to federal road design guidelines is giving a big leg up to “complete streets” advocates and paving the way (sorry) for safer, more pleasant, and more lively urban neighborhoods. The Federal Highway Administration is removing many of the “outdated” requirements for urban streets with speed limits below 50 mph, including leaving “clear areas” with no permanent objects, such as trees, within a certain distance of the road bed, and excessive width. 3. PBS takes a closer look at two Texas metropolises that are taking very different approaches to their light rail systems. While Dallas has built one of the most extensive light rail networks in the country, most of its track passes through extremely low-density neighborhoods, and many stations are surrounded by parking lots, with few jobs or other destinations within walking distance. As a result, its ridership per mile of track is extremely low, posing financial challenges. Houston, in contrast, has so far built a much smaller network, but its line goes through the densest parts of the city, and planners are trying to encourage more dense development within walking distance of stations. Not surprisingly, its ridership per mile is much higher: Houston’s light rail system gets about half the ridership of Dallas’, despite being just a quarter as big. 1. Who gets economic development subsidies? A new study from Good Jobs First suggests that small and local businesses are mostly shut out. The 4,200 deals in 14 states examined by the study were worth $3.2 billion—of which about 90 percent went to large or non-locally-owned businesses. GJF recommends that states reform their economic development programs to create public benefits for all employers by, for example, redirecting money to job training, education, transportation, and credit access programs. 2. Project-based rental subsidies, which provide affordable housing for more than 1.2 million households across the country, need to be periodically renewed to keep their subsidies. 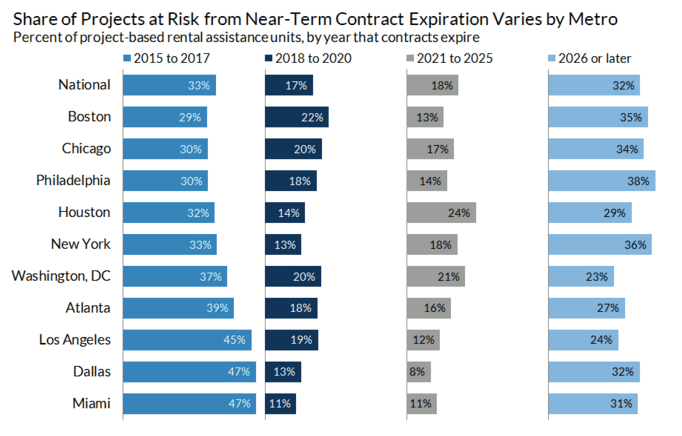 The Urban Institute reports that fully a third of PBRA units are up for renewal in the next few years, running the risk of dropping tens of thousands of affordable units from our cities in the midst of a growing housing affordability crisis. While most PBRA leases are renewed, the likelihood that projects are converted to market-rate rents increases in areas with high market prices—exactly where they’re most needed to promote integration and economic opportunity. 3. More evidence on the problem of under-priced road space: researchers from Turkey and the Netherlands examine the cost of “cruising,” or driving around looking for parking, generated by a marginal shopping trip. They find that in a given shopping district in Istanbul (though these findings could be applied to other busy districts with under-priced parking, leading to an excess of demand), the direct cost of traffic congestion caused by a car trip is dwarfed by the cost of the additional time other drivers spend cruising for parking because that particular space is already occupied. The takeaway is that proper pricing of public parking spaces could significantly reduce one of the major social costs of car travel.